When I graduated from college, I moved in with roommates. So did almost all of my college friends. And almost all of their college friends. Fifty years ago, this would have been utterly bizarre. 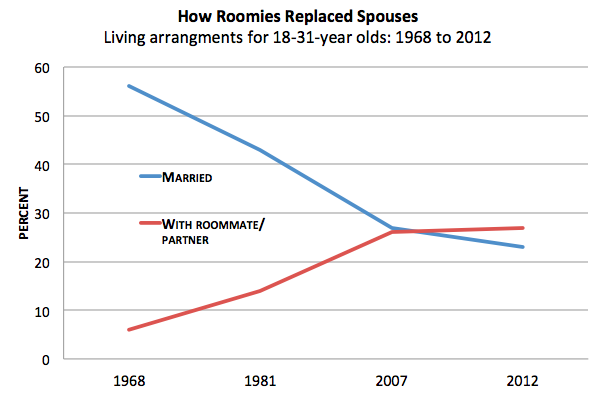 In 1968, just six percent of young people --between 18 and 31 -- lived with platonic roommates, according to Pew Research. The vast majority (85 percent!) 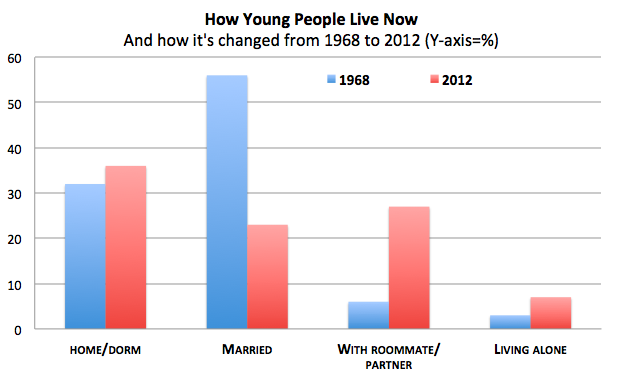 of Americans who had moved on from their homes and college dorms shacked up with spouses. Put more quirkily: In 1968, if you wanted to throw a dinner party for all your twentysomething friends who had moved out of their parents' home, and you invited three girls who lived together, you would have to invite fourteen married couples to make the party proportionally representative of your generation's living arrangements (okay, not a priority for most dinner parties, parties, but still.) Roommate was a synonym for spouse, basically. What changed? More school and fewer spouses, for starters. The share of adults with a bachelor's degree has nearly doubled since 1968, and most of the change is because of women who rallied into the workforce. As more women grabbed degrees, the average marriage age has steadily inched up into the upper 20s. Meanwhile, birth control, in particular normalization of "the pill," nearly eliminated the odds of becoming pregnant, allowing women to invest with confidence in their work-life and delay marriage without worrying about an unwanted pregnancy derailing their careers. Meanwhile, for lower-income women, marriage rates have declined for more debatable reasons. That's a rough explanation for why fewer couples are getting married in their early 20s, which is itself a rough explanation for the growth of platonic roommates, but surely there's more. Any other ideas?